DONETSK, Ukraine (AP) — Pro-Russian insurgents in eastern Ukraine say preliminary results of a contentious referendum show nearly 90 percent of voters have supported sovereignty for their region. Roman Lyagin, election chief of the self-styled Donetsk People's Republic, said around 75 percent of the region's 3 million voters cast ballots Sunday. With no independent observers monitoring the vote, however, verifying the figures will prove problematic. The referendum took place amid sustained condemnation from the central government in Kiev and the Western community. A rebel movement has emerged in eastern Ukraine over recent weeks in response to the ascent to power of the leadership that toppled pro-Russian President Viktor Yanukovych in February after months of public protests. 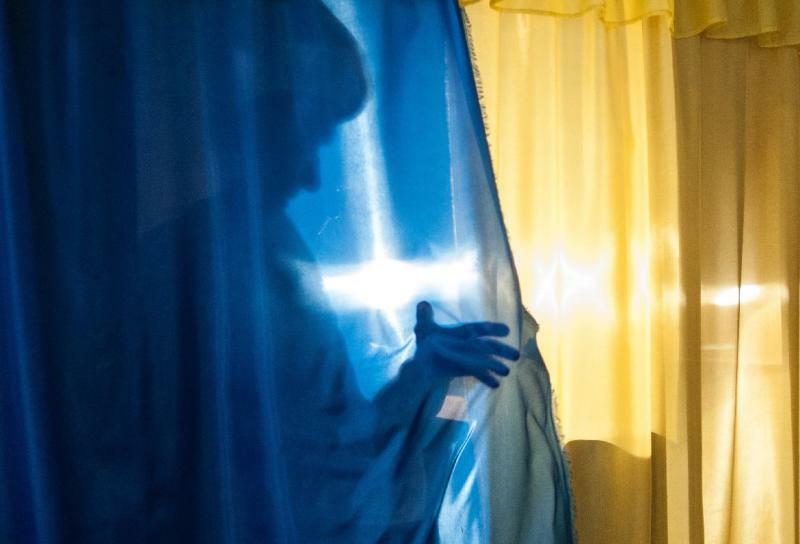 Voters in two insurgent Ukrainian regions cast ballots Sunday on whether to declare their areas sovereign republics, a move denounced by the central government and likely to deepen the turmoil in the largely Russian-speaking east. Although the voting in the Donetsk and Luhansk regions appeared mostly peaceful, armed men identified as members of the Ukrainian national guard opened fire on a crowd outside a town hall in Krasnoarmeisk, and an official with the region's insurgents said people were killed. It was not clear how many. The bloodshed took place hours after dozens of armed men shut down the voting in the town, and it starkly showed the hair-trigger tensions in the east, where pro-Russian separatists have seized government buildings and clashed with Ukrainian forces over the past month. Ukraine has accused Moscow of fomenting the unrest, and on Sunday the Foreign Ministry called the twin referendums a "criminal farce." The U.S. and other Western governments have branded the balloting a violation of international law and said they won't recognize the outcome. The results were not expected to be announced until Monday afternoon. Organizers predicted high turnout across the two industrial regions, which have a combined population of 6.5 million. The head of the referendum organizers in Donetsk said the ultimate status of the region would be discussed later and would include the possibility of secession or annexation by Russia. "We are just saying to the world that we want changes, we want to be heard," election commission head Roman Lyagin said. The violence in Krasnoarmeisk, about 30 kilometers (20 miles) from the regional capital, Donetsk, came hours after armed men, one of whom said they were from the national guard, broke up the voting outside the town hall and took control of the building. In the evening, more armed men arrived in a van, and a scuffle broke out with people gathered around the building. Then the men fired shots. An Associated Press photographer who witnessed the shooting said two people lay motionless on the ground. Insurgent leader Denis Pushilin was quoted by the ITAR-Tass news agency as saying there were an unspecified number of deaths. Over the past few weeks, the Ukrainian government and the West have accused Russia of trying to destabilize the country or create a pretext for another invasion. Russia — which annexed Ukraine's Crimean Peninsula just days after voters there approved secession in a March referendum — has rejected the accusations. Russian President Vladimir Putin had asked the organizers of the latest referendums to delay the vote in an apparent attempt to ease the worst crisis in relations between Russia and the West since the Cold War. The insurgents refused to heed his call. Election organizers said turnout topped 70 percent by late afternoon, but with no international election monitors in place, it was all but impossible to confirm such claims. At one polling station at a school in Donetsk, turnout was brisk in the first hour of voting. All voting slips that could be seen in the clear ballot boxes showed that autonomy had been selected. Most opponents of sovereignty appeared likely to stay away from the polls rather than risk drawing attention to themselves. Darya, a 25-year-old medical worker who would not give her last name, said she saw no point in casting a ballot, since the vote had no legal force. "There were no notices about this referendum anywhere, about where and when it was happening," she said. "In any case, it is not valid, so there was no reason to take part." There were no immediate signs of any outright intimidation by pro-Russian forces Sunday, and insurgents near the polls were not wearing their usual balaclavas. The haphazard nature of the referendums was in full display at Spartak, a leafy village on the fringes of Donetsk. Villagers were unable to vote for about three hours after the polls opened because election officials failed to bring a ballot box. After some arguing between local people and the head of the village council, an election organizer arrived with a voting urn crudely fashioned from cardboard boxes and sealed with tape. Most present said they were voting in favor of autonomy and against the interim government headed by acting President Oleksandr Turchynov. One said she would not take part in a nationwide presidential election set for May 25. "I don't agree with what is happening in the country. And I want some changes for the better. What is happening on May 25 is not honest, truthful or in our best interests. And that is why I am voting today," said Irina Zelyonova, 30, cradling her baby in her arms. Turchynov and Ukraine's caretaker government came to power in February following the ouster of Kremlin-friendly President Viktor Yanukovych after months of protests in Kiev. Moscow and many in Ukraine's east have accused the new government of intending to trample the rights of eastern Ukraine's Russian-speakers. More than 30 people have been reported killed since Ukrainian forces began trying to retake some eastern cities from the insurgents. Mark Rachkevych in Kiev, Ukraine, contributed to this report.